Regensburg, Germany – The world’s largest event for hosting professionals is going to celebrate its tenth anniversary in 2014. From April 1-3, experts and insiders from the international hosting business will meet at the WHD.global in Europa-Park Rust, Germany. As a specialist for innovative hosting and server products InterNetX is going to present its current offers and strategies for the new gTLD business. At the industry event experts from all over the world are going to discuss the latest trends and developments in the hosting business. InterNetX will be present in the exhibition area with its own stand (B16/18). In the conference part, Marco Hoffman, Head of Domain Services at InterNetX, is going to talk about sales strategies for the new domain endings. His presentation “The Big Bang of new gTLDs: Drive the hosting business with targeted new gTLD strategies!” will begin at 15.30 (CEST) on April 1 in “Bellevue” hall. The InterNetX booth is all about this year’s “big bang”, which will catapult the domain and hosting industry into new dimensions. Since the beginning of 2014 about five new domain extensions have been going online each week. The launch of the GeoTLD .BERLIN in mid-March marked the most successful start of any new domain ending so far. Within hours, more than 20,000 .BERLIN addresses were registered. With the launch of .BERLIN InterNetX has further strengthened its position as one of the leading domain registrars. This makes InterNetX the number 1 among .BERLIN registrars in the business sector and rank three among all .BERLIN registrars. In an international comparison of all 98 new gTLD registrars and all new top-level domains InterNetX ranks firmly in the top 10. In order to utilize the possibilities of the new gTLDs new technical concepts and business strategies need to be applied. The InterNetX experts are going to present the best solutions for all requirements at their booth. And all those who want to prove their skills with a laser gun in a game of “Domain Invaders” will have the chance to win attractive prizes. 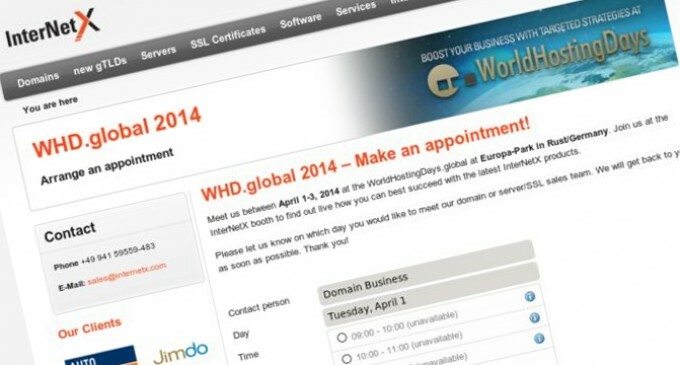 WHD.global is the largest and most important meeting of the international hosting industry. The main event of the WorldHostingDays series is held in Europa-Park Rust, Germany. More than 120 exhibitors and media partners will present their products in the trade fair. Last year around 4,800 participants from 86 countries attended the WHD.gobal. InterNetX is one of the leading providers of first-class domain products and hosting solutions. With more than 3.6 million managed domains, over 300 offered ccTLDs and gTLDs and more than 2,000 hosted servers, InterNetX is one of the most successful providers for resellers and professional users on the international market.